MILWAUKEE (AP) Marquette guard Markus Howard usually doesn’t leave the gym in the offseason until he has hit at least 300 3-point shots. No reason to change his routine now after leading the country with 54 percent shooting from 3-point range last season as a freshman. The sharpshooting Howard will take on more responsibility this season for a team looking to making a second straight NCAA Tournament appearance. He will assume an expanded leadership role following the departure of two senior starters and two other key reserves. 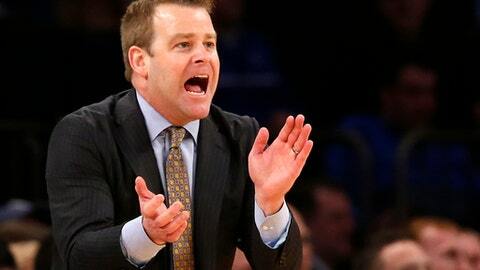 He wants to play better defense, a must under fourth-year coach Steve Wojciechowski. And Howard realizes that he will be the target of opposing teams, especially until Marquette establishes an inside presence in place of departed big man Luke Fischer. Often times last year that meant taking a 3-point shot. Howard averaged 13.2 points a game overall as a freshman, but 15.4 points in Big East play. He shot 57 percent (55 of 96) against conference foes. ”Certainly I’ve been around some outstanding shooters. He’s up there with any of them,” said Wojciechowski, a former Duke assistant who played his college ball with the Blue Devils. If the in-season work ethic comes close to the time that Howard puts in with his shot in the offseason, Wojciechowski should be pleased come March. Howard credits an older brother with helping him develop his offseason habit of shooting hundreds of 3s a day, which he has done since middle school. BACK IN THE DANCE: Marquette’s first trip to the NCAAs under Wojciechowski’s tenure offered more proof that the program is headed in the right direction. The Golden Eagles lost in the first round to eventual Final Four team South Carolina. It was Marquette’s first appearance in the NCAAs since 2013, when Buzz Williams was the coach of a squad led by Vander Blue. PUT IT UP: Howard’s backcourt mate, Andrew Rowsey, isn’t shy about shooting from long range, either. The quick, 5-foot-11 guard was the Big East Sixth Man of the year last season, finishing fourth in the country in foul shooting (92 percent). Rowsey hit 48 percent from 3-point range (44 of 91) in Big East play. DOWN LOW: The 6-foot-11 Fischer’s post presence and leadership will be missed, though the roster does add height this year with the addition of three freshmen forwards and center Harry Froling, a 6-foot-11 transfer from SMU eligible in mid-December. Wojciechowski also likes the way that 6-foot-10 junior Heldt (2.3 points, 2.9 rebounds) has developed since arriving at Marquette as a raw project. DEFENSE: The freshmen forwards each stand at least 6-foot-7. After being forced to use a four-guard lineup for much of the time around Fischer, the Golden Eagles should have more length on the court. ”We have more big guys than we do guards, and so we take up a lot more space on the court, and hopefully that will lend itself to a few more contested shots than maybe we had last year,” Wojciechowski said. GLUE GUY: Six-foot-eight swingman Sam Hauser quickly became an important piece last year as a freshman, displaying the consistency of four-year starter. Hauser will take on more offensive responsibility after averaging 8.8 points and 5.0 rebounds in a team-high 26.5 minutes a game.